“Risk” serves to model layers of protection or Safety Instrumented Systems using either the bow-tie method or a LOPA (Layer Of Protection Analysis) table. 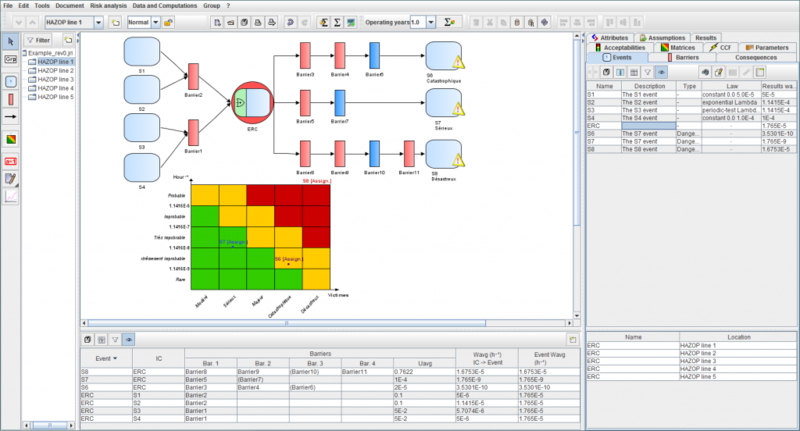 In addition to a user-friendly graphical interface shared by the entire GRIF workshop, the Risk module is based on ALBIZIA, the BDD (Binary Decision Diagram) computation engine developed by Total. ALBIZIA’s strength is its capacity to run precise probabilistic calculations and to supply much of the information required for risk studies. 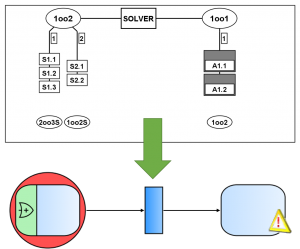 Entering bow-tie diagrams is very simple and based on an intuitive graphical user interface. The different elements can be entered quickly, i.e. the initial events for which the user specifies the frequency of occurrence, the final events and their criticality, and the barriers for which the failure is defined based on the many laws available. The lower section is used to enter a LOPA using a table. In this case, a scenario is created by entering the unwanted event (existing or new), the initial cause and the different barriers included in the protection measures. The bow-tie model is built and automatically formatted in the data entry zone. The instantaneous and average frequencies for all scenarios. The demand frequency of barrier. 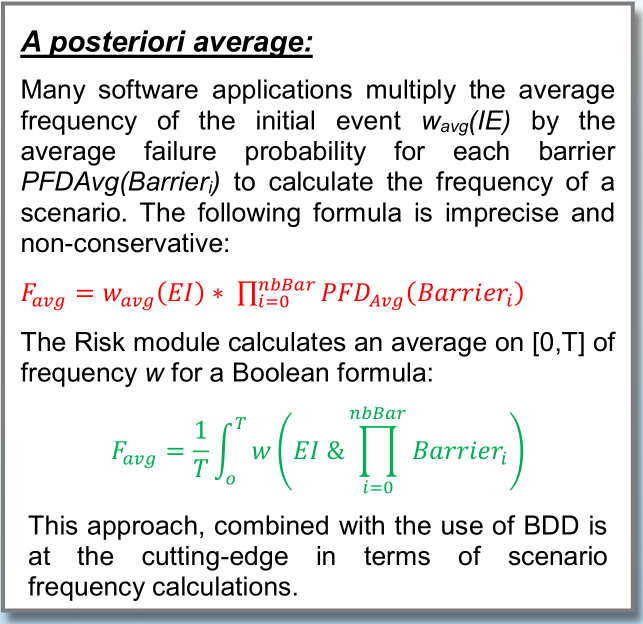 The PFD and PFH of barrier, which have been specified in detail (periodic test, SIL loop, etc.). The Risk Reduction Factor required to remain within an acceptable risk zone. The importance factor (including Barlow Proschan) to identify the barriers to be improved. Several risk matrices can be defined, such as a Safety, Assets or Environment risk matrix. For each matrix, a criticality level is defined: moderate, serious, major, etc. The criticality thresholds and frequency limits can be configured. For each scenario, a risk is recorded on each matrix. A scenario can be qualified as catastrophic in terms of Human risks but moderate if it is considered in terms of Financial and vice versa. Do you run regular studies that contain the same safety barriers and the same risk matrices? 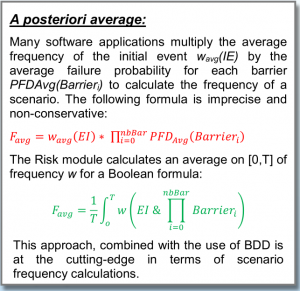 GRIF Risk enables you to create models with a certain number of pre-configured barriers and risk matrices. Input data summarized in tables making it easier to check the quality of an entry. Possibility of automating calculations (batch runs). Results are stored in the document and can be exported in a variety of formats (csv, XML, Excel, etc.). Results can be viewed as line graphs, pie charts, histograms or risk matrices. Vectorial printing in PDF format to maintain flawless quality even in A3 or A2 format. Interaction with the operating system: possibility of copying/pasting matrices and results into other word-processing software, spreadsheets or presentation tools. Can be connected to MySQL, Access and Excel databases to recover values to be used for settings. Bow-tie diagrams created in Risk can interact with any model from a Boolean package: Fault Tree, Reliability Block Diagram, SIS, etc. A barrier or initial event can therefore be detailed and the dependencies among barriers that may share certain components, can be factored in. When the Risk module has indicated the required Risk Reduction Factor, a Safety Instrumented Function from the SIL module can then be added to the bow-tie model using the Bool module. This approach ensures that the loop achieves the required PFD/PFH and confirms that the new frequency for each scenario falls within an acceptable zone.